The wolf was thin, but not ema­ci­at­ed. I judged it to weigh per­haps eighty or nine­ty pounds; less than me, but not enough to give me any great advan­tage. The lever­age was def­i­nite­ly in the animal’s favor; four legs against two gave bet­ter bal­ance on the slip­pery crust of snow. I hoped brac­ing my back against the wall would help. A cer­tain feel­ing of empti­ness at my back told me I had reached the cor­ner. The wolf was some twen­ty feet away. This was it. I scraped enough snow from under my feet to give good foot­ing and wait­ed. I didn’t even see the wolf leave the ground. I could swear I had been watch­ing its eyes, but if the deci­sion to leap had reg­is­tered there, it had been fol­lowed by action too swift­ly to note. It was instinct, not thought, that raised my arm as a whitish-grey blur hur­tled toward me. The teeth sank into the padding with a force that bruised my arm. It was heav­ier than I thought; I was unpre­pared for the weight, and my arm sagged. I had planned to try to throw the beast against the wall, per­haps stun­ning it. Instead, I heaved myself at the wall, squash­ing the wolf between the stone blocks and my hip. I strug­gled to wrap the loose cloak around it. Claws shred­ded my skirt and scraped my thigh. I drove a knee vicious­ly into its chest, elic­it­ing a stran­gled yelp. Only then did I real­ize that the odd, growl­ing whim­pers were com­ing from me and not the wolf. Strange­ly enough, I was not at all fright­ened now, though I had been ter­ri­fied watch­ing the wolf stalk me. There was room in my mind for only one thought: I would kill this ani­mal, or it would kill me. There­fore, I was going to kill it. There comes a turn­ing point in intense phys­i­cal strug­gle where one aban­dons one­self to a prof­li­gate usage of strength and bod­i­ly resource, ignor­ing the costs until the strug­gle is over. Women find this point in child­birth; men in bat­tle. Past that cer­tain point, you lose all fear of pain or injury. Life becomes very sim­ple at that point; you will do what you are try­ing to do, or die in the attempt, and it does not real­ly mat­ter much which. I had seen this sort of strug­gle dur­ing my train­ing on the wards, but nev­er had I expe­ri­enced it before. Now all my con­cen­tra­tion was focused on the jaws locked around my fore­arm and the writhing demon tear­ing at my body. I man­aged to bang the beast’s head against the wall, but not hard enough to do much good. I was grow­ing tired rapid­ly; had the wolf been in good con­di­tion, I would have had no chance. I hadn’t much now, but took what there was. I fell on the ani­mal, pin­ning it under me and knock­ing the wind from it in a gust of car­rion breath. It recov­ered almost imme­di­ate­ly and began squirm­ing beneath me, but the second’s relax­ation enabled me to get it off my arm, one hand clamped under its wet muz­zle. By forc­ing my fin­gers back into the cor­ners of its mouth, I man­aged to keep them out from between the scis­sor­ing car­nas­sial teeth. Sali­va driz­zled down my arm. I was lying flat on top of the wolf. The cor­ner of the prison wall was per­haps eigh­teen inch­es ahead of me. Some­how I must get there, with­out releas­ing the fury that heaved and squirmed under me. Scrab­bling with my feet, press­ing down with all my might, I pushed myself for­ward inch by inch, con­stant­ly strain­ing to keep the fangs from my throat. It can­not have tak­en more than a few min­utes to move those eigh­teen inch­es, but it seemed I had lain there most of my life, locked in bat­tle with this beast whose hind claws raked my legs, seek­ing a good rip­ping pur­chase in my bel­ly. At last I could see around the cor­ner. The blunt angle of stone was direct­ly in front of my face. Now was the tricky part. I must maneu­ver the wolf’s body to allow me to get both hands under the muz­zle; I would nev­er be able to exert the nec­es­sary force with one.I rolled abrupt­ly away, and the wolf slith­ered at once into the small clear space between my body and the wall. Before it could rise to its feet, I brought my knee up as hard as I could. The wolf grunt­ed as my knee drove into its side, pin­ning it, how­ev­er fleet­ing­ly, against the wall. I had both hands beneath its jaw now. The fin­gers of one hand were actu­al­ly in its mouth. I could feel a crush­ing sting across my gloved knuck­les, but ignored it as I forced the hairy head back, and back, and back again, using the angle of the wall as a ful­crum for the lever of the beast’s body. I thought my arms would break, but this was the only chance. There was no audi­ble noise, but I felt the rever­ber­a­tion through the whole body as the neck snapped. The strain­ing limbs—and the bladder—at once relaxed. The intol­er­a­ble strain on my arms now released, I dropped, as limp as the dying wolf. I could feel the beast’s heart fib­ril­lat­ing beneath my cheek, the only part still capa­ble of a death strug­gle. The stringy fur stank of ammo­nia and sog­gy hair. I want­ed to move away, but could not.I think I must have slept for a moment, odd as that sounds, cheek pil­lowed on the corpse. I opened my eyes to see the green­ish stone of the prison a few inch­es in front of my nose. Only the thought of what was tran­spir­ing on the oth­er side of that wall got me to my feet. I stum­bled down the ditch, cloak dragged over one shoul­der, trip­ping on stones hid­den in the snow, bang­ing my shins painful­ly on half-buried tree branch­es. Sub­con­scious­ly, I must have been aware that wolves usu­al­ly run in packs, because I do not recall being sur­prised by the howl that wavered out of the for­est above and behind me. If I felt any­thing, it was black rage at what seemed a con­spir­a­cy to thwart and delay me. Weari­ly I turned to see where the sound had come from. I was in the open away from the prison by this time; no wall to brace my back against, and no weapon to hand. It had been luck as much as any­thing that helped me with the first wolf; there was not a chance in a thou­sand that I could kill anoth­er ani­mal bare-handed—and how many more might there be? The pack I had seen feed­ing in the moon­light in the sum­mer had had at least ten wolves. I could hear in mem­o­ry the sounds of their teeth scrap­ing, and the crack of break­ing bones. The only ques­tion now was whether I both­ered to fight at all, or whether I would rather just lie down in the snow and give up. That option seemed remark­ably attrac­tive, all things con­sid­ered. 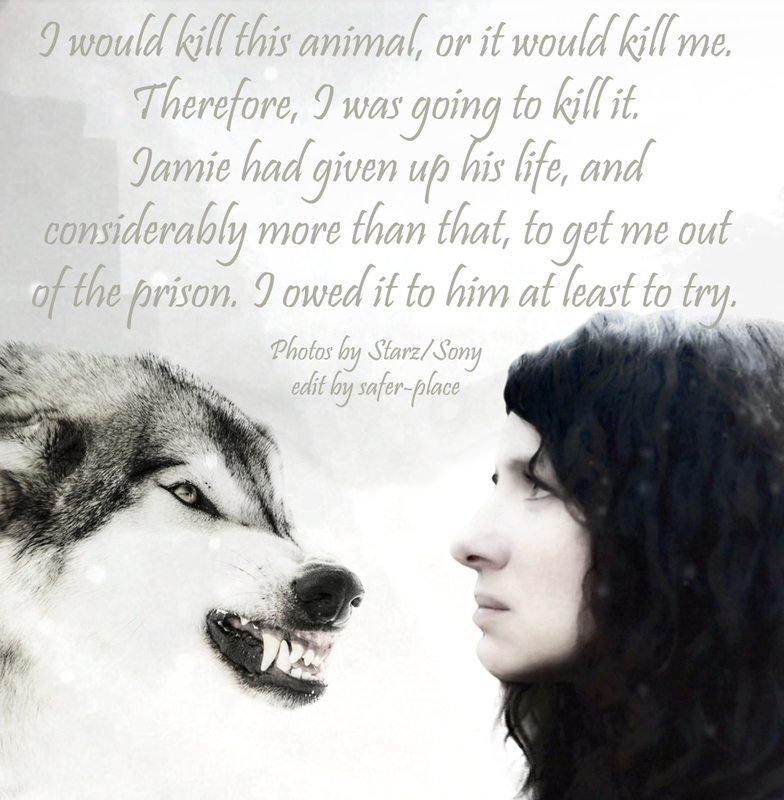 Still, Jamie had giv­en up his life, and con­sid­er­ably more than that, to get me out of the prison. I owed it to him at least to try. This was such an excit­ing part of the book. Claire was so very deter­mined to get away and fine help for Jamie. She was found and tak­en to MacRannock’s. The cops came to the res­cue! Jamie was res­cued ‚and tak­en back to MacRannock’s. Claire tend­ed to his hand. We learned about Ellen’s bracelets and Murtagh’s love for her. We found out where the Scotch pearls came from. We met John Wayne! Claire killed a boy to pro­tect Jamie. They made it to France despite per­va­sive­ness! Aww, the book is always bet­ter! Thank you, Heike! I remem­ber when!? That is sup­posed to be COOS! And I proof-read this! No ques­tion mark at end either! Writ­ing and spelling are hard enough! I don’t need any help from my Kin­dle ‘s auto-cor­rect! Thank you for all your beau­ti­ful work and ideas! you are welcome..its for me a plea­sure to do and help me throught With­Out­lander very much :)..
You know, there were so many bits and pieces left out.…because at least every oth­er page could have been a great scene. The first sea­son would have went on for 5 years…by the time we get to book 3, Sam and Cait would be the actu­al age of Jamie and Claire! Thank You so much for shar­ing your talents.….you make me smile every­day!